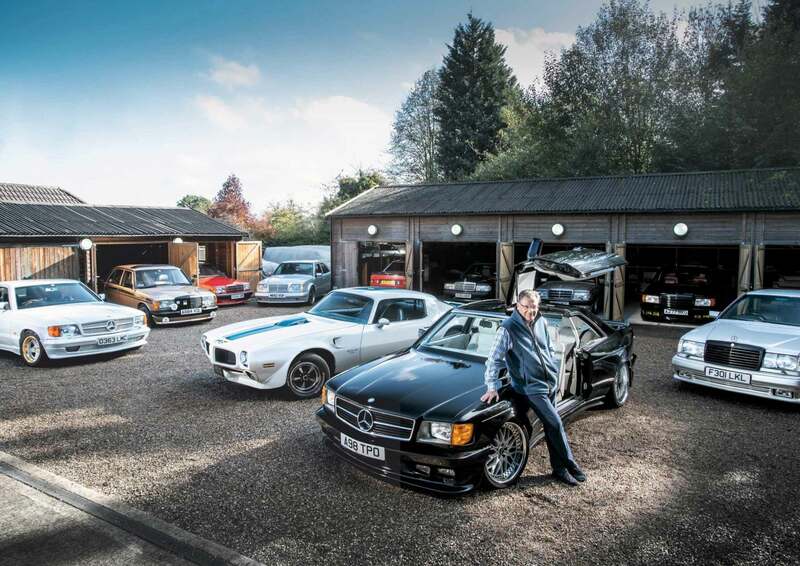 The Collector Meet Neville Brown, owner of some of the wildest Mercedes tuner specials that you’ll ever see ‘The thrill is in the chasing down of unobtainium’ A fixation with overt German tuner specials means a never-ending hunt for obscure spare parts. Neville Brown has made that his lifeblood. Words Richard Mason. Photography Charlie Magee. Says Neville Brown, ‘I just love modified cars. 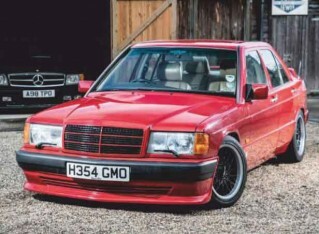 Unmodified cars bore me to death, but once they’ve got AMG, Lorinser, Koenig, or Brabus parts on them they’re like art to me; they intrigue me.’ Neville’s Mercedes-centric collection is a fusion of Teutonic, Middle- and Far-East flavours, with an American police car and a Ford Zodiac hot rod adding extra spice. Neville’s cars are spread over a large site comprising timber garages that have grown with demand. Nearby a line of green opaque car storage bubbles conceal yet more exotica. Neville’s office is a time capsule with posters, signs, photos and models of cars and powerboats – another of Neville’s passions – all from the Eighties. With the tone set by the entrées, it’s time to explore the meat of the collection. 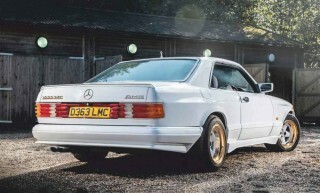 Neville bought his first Mercedes when he was 25 years old, some 30 years ago, that sentimental link anchoring it in his collection. Inspired by a similar car Brabus had created for a senior executive, Neville got busy. ‘It has Brabus springs and dampers, uprated brakes with Tyrox discs all round shod with Brabus Monoblock wheels, and Brabus visual parts comprising bodykit and interior. The wooden dash took me years to collect, so all the parts were in different shades. I took them to a wood specialist and showed him a picture of the dash in a Brabus catalogue. He recreated the exact colour, which is a Brabus light Zebrano.’ Neville has kept the engine standard, but like any classic car owner there is always one thing left to do – in this case fitting a Brabus exhaust. ‘This was my first modified Mercedes. I bought it as a genuine Widebody – for example the extended rear wings are steel, rather than the glassfibre of the replicas. 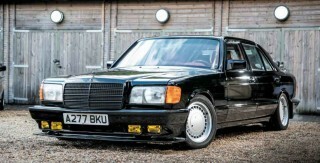 It was supplied with correct AMG suspension, exhaust, steering wheel and dials by Normands of Bromley. I heard about it from Mercedes dealer Rose & Young of Redhill. I was always badgering the staff about AMG stuff and they began to take an interest in me. They mentioned a client had this car for sale although the wheels were scruffy. So I bought it and fitted 24 carat gold-plated wheels from a Saudi car. I wonder why Neville has let one of the rarest Mercs on the planet become a haven for spiders, covered in dust. ‘Well, I bought it years ago planning to put the engine into a Mercedes SEL, would you believe. However, I then found another Hammer engine, so this wasn’t needed and has just sat. Obviously the market for these has now changed and taking the engine out would have been criminal. This is one of six right-hand-drive cars, basically sound, just in need of recommissioning.’ The SEC is on Neville’s ‘to-do list’ because he has an SEL with an identical engine to fettle, which will produce a matching pair – another of Neville’s passions. With its gullwing doors open, this black-over-white SEC is a showstopper. Neville takes up the story, ‘These cars were for Middle Eastern clients who liked hunting with birds of prey. The gear selector is in the shape of a falcon’s head. The idea was to drive along at 75mph with the doors up and the guy in the passenger seat would release the falcon, which would fly alongside. Remember, this was out in the desert, not Knightsbridge. Although it lacks the visual statement of its winged cousin, sitting in the Eighties opulence of the other Styling Garage SEC is like wearing an Armani suit with shoulder pads. It was a must-have car for Neville, considering his fondness of matching pairs. ‘This one is fitted with a Styling Garage bodykit and wheels, with Koni dampers. Inside there are picnic tables, side and rear privacy curtains, a fridge in the rear centre armrest, and above that a leather-covered cupboard for whisky glasses. The rear bucket seats recline individually. Next is a near-unmarked police car previously used by a Massachusetts sheriff; a badge on the boot says ‘Police Interceptor’. So what’s the rationale behind this outlier? ‘I got this two years ago after I started reading about a US firm called ADTR, which specialises in tuning Crown Victorias – you can see where this is going! I have the original build sheet when it was bought for $25,000, and it includes many modifications like Kevlar bulletproof door linings, stab-proof metal sheets in the back of the front seats, and vinyl rear seats and floor coverings to make it easy to wash out. It also has the courtesy light delete so it wouldn’t attract attention when the door was opened. ‘I’ve made some cosmetic changes and I plan to fit more ADTR performance parts, but this is already a 150mph car; floor it at 100mph and it keeps on going. It has a police-spec 4.6-litre V8 engine with bigger intakes and other modifications including gearing; the springs are also tougher and dampers are stiffer, so it handles better. Then there’s an idler gauge to show how long the engine’s been running – these cars would spend hours with the engine idling during a stake-out because aircon was vital. Next it’s back to Stuttgart specials and one that would give the Crown Victoria a run for its money. The E500 was hand-built for Mercedes by Porsche, but with no Porsche parts. It had shattering performance, with 60mph coming up in six seconds dead and a derestricted top speed of 178mph, so the chassis was strengthened and given lower, stiffer suspension to cope. It also boasted four Recaro seats and flared wheelarches. But that wasn’t enough for Neville, ‘The Limited had a grey leather interior with a bespoke pattern on the seats and doorcards. I’ve had the car refurbished in the style of the Auto Fashion Factory of Yokohama, which was very influential with this type of car. One car that generates more enthusiasm in Neville is the humblest of his collection, ‘It was originally a bog-standard 240 diesel, but at some point it was converted to a 3.0-litre M103 engine with the interior from a W126. The electrics were all bundled up and slung inside, the propshaft was too short – it was a complete nightmare. ‘We trailered it back here and set to work. What attracted me to it was that the hard work, the engine conversion, had already been done. So we tidied up the electrics and installed the electric front-seat controls at the bottom of the dashboard. I fitted an AMG steering wheel and had all the wood trim redone in piano black, which is an AMG colour of the time. A departure was fitting a CB radio in a phone format – very rare but of the time. Then there’s the stereo linked to the four vintage Eighties Pioneer speakers on the rear parcel shelf – the rubbers had perished so I sourced a repair kit from Germany and had them rebuilt. ‘The black AMG side stripes were made for me by some guys in California. They normally do them for the coupé, but did a one-off set for me. I have photos of the saloons with the stripes, so they’re period correct. This car was always gold, although it has been resprayed. Hen’s-teeth Hammer has been left to collect dust – but it could have been worse... 1000SEC badge is pie in the sky but 24 carat goldplated wheels are the real deal Trans Am is a carry-over from a previous fixation with US muscle cars... ...and has had its engine enlarged to 7.7 litres. 500SEC-based SGS Gullwing is believed to be one of a handful left in existence ...and gave it chrome wheels and a Mustang splitter Boomerang antenna for SGS 500SEL’s dashboard TV... ...and Maybach levels of amenity in the rear.